Seth G. Roman, partner at Carter DeYoung and former Assistant District Attorney for Barnstable county specializes in Personal Injury, Criminal Defense and Civil Litigation. As a litigator, or courtroom trial attorney, Attorney Roman handles tort, negligence and personal injury cases, criminal matters and OUI, (Operating Under the Influence) cases, business, contract and estate disputes, and construction matters. The number one reason why someone would need a criminal lawyer is to protect their rights and ensure that the government plays by the rules. While criminal defendants are presumed to be innocent until proven guilty, the opposite is often true. Assistance from an attorney helps level the playing field, and guarantees the defendant his/her right to a fair trial. OUI – ARE YOU AN OPERATOR? Late one night John was found asleep in his car by police. The car was parked in a private lot not far from a local bar he was known to frequent. When the police searched the car, they did not find the keys in the ignition, but rather in the pocket of his coat, which was in the trunk. John’s blood alcohol level was above the legal limit of .o8%, and he was charged with Operating Under the Influence. At trial, John pled not guilty to the OUI charge. He argued that the prosecution must prove that he was “operating a motor vehicle on a public way”, two elements that are sometimes forgotten amidst all the attention given to blood alcohol content levels (BAC). As John’s car was found in a private parking lot and not on a roadway he was not on a “public way”. Additionally, he was not “operating” the vehicle at the time he was arrested. If you are ever charged with a crime, remember that you are not required to give any statements to the police. You have a constitutional right not to incriminate yourself under the 5th Amendment of the United States Constitution. If John had admitted to the police that he had driven directly from the bar to the lot to sleep it off, he would probably have been convicted. Outcome: An OUI requires the prosecution to produce evidence that you were drinking prior to driving. Having keys in the ignition of your vehicle has been found to be sufficient to meet the element of “operating a vehicle,” even if the car is not moving. The parking lot of your local supermarket may be considered a “public way,” as it is open to members of the public as invitees or licensees. Luckily for John, the keys were not in the ignition or readily available, and he was sleeping in a private lot, having made the right decision not to drive home. Who’s at fault, the car accident driver or the motorcycle accident driver? I represented a man who was charged with motor vehicle homicide by negligent operation and faced significant jail time. He was turning left into a parking lot and was struck by motorcycle in the opposite lane, resulting in the tragic death of the motorcycle driver. The police conducted an extensive reconstruction of the accident and concluded that my client failed to yield to the oncoming motorcycle. The police concluded that the motorcycle was traveling at a safe and reasonable speed, and that my client was responsible for his death. I immediately engaged an expert who found several flaws in the reconstruction analysis conducted by the police. I attempted to make arrangements to inspect the motorcycle, which would have allowed my expert to perform her own tests and take her own measurements to determine the speed of the motorcycle at the time of the collision. The police, however, released the motorcycle to the insurance company and it had been junked. I filed a motion to dismiss the case, arguing that my client had been denied the right to have his own expert analyze the crash as a result of spoliation of evidence by the police. RESULT: The judge agreed, and the case was ultimately dismissed. Every person charged with a crime has a right to be represented by an attorney. If a person cannot afford an attorney, the court will usually appoint a public defender or bar advocate to represent him/her at no cost or at a reduced cost. The problem with this system is that the client has no choice in who is appointed. Some court-appointed attorneys are highly qualified, while some are not equipped to handle serious or complicated cases. (c) if convicted, the extent of punishment they face. 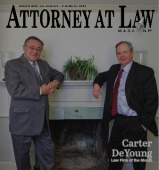 At Carter DeYoung, we utilize a team approach based upon experience. Two of our attorneys are former criminal prosecutors, and one was a former police officer and FBI agent. We have longstanding relationships with private investigators and expert witnesses that complement the legal services we provide.